Did you know that the ‘K’ in ‘K Shoes’ stands for Kendal? Or that Postman Pat came from Kendal? 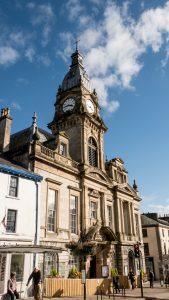 This attractive town in north west England on the edge of the Lake District is a treasure trove of hidden secrets and fascinating facts. I’ve worked here for many years and have only scratched the surface of its many sights. On a sunny day in January I set off to explore more of the town, with the help of two leaflets: Kendal’s Culture Guide and Kendal’s Trails. I started at the K Shoes Heritage Centre in K Village on the edge of town. Taking the lift up to the centre is to step back in time 160 years to when the Somervell Brothers set up their footwear manufacturing company. A dainty pair of white kid dancing shoes contrast with the stout mountain boots worn by Howard Somervell when he climbed Everest. The iconic K Skips sit in a case near smart brogues. Photos of the workforce over the years bring the town’s industrial past alive in this unique collection. From here I wandered off along the banks of the River Kent, past the large Parish Church and the rear of elegant 18th c Abbot Hall Art Gallery, once a family home and now housing one of the North’s best collections of contemporary international art. A sleek otter raised its head out of the river, stared at me for a few seconds then slid back into the fast-flowing water. On I walked, past the Somervell Memorial Garden, over the bridge and on to the Quaker Meeting House. The Quaker Tapestry Museum attracts visitors from all over the world. 70 panels were made by 4,000+ people from 15 countries illustrating over 300 years of Quakerism. 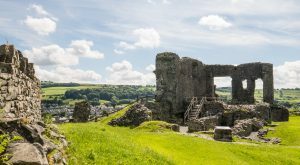 Up to Kendal Castle, an attractive ruin once owned by the family of the only wife of Henry VIII to outlive him – Catherine Parr. I climbed up the round tower for an excellent view over the town. In the distance the Lakeland fells glittered with a sprinkling of snow. Back in town, I had another look at the map and decided to call in at Kendal Museum. 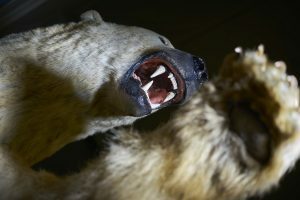 Founded in 1796 it’s been recently refurbished and houses an eclectic mix of Roman artefacts, stuffed birds and animals, including a popular polar bear, geological specimens, medieval jewellery, items belonging to renowned locals and, oh yes, a dodo. I stopped off at the quaint Chocolate Shop (1657) for a bit of sweet indulgence then on to the Market Place. In 1189 Kendal got a charter from King Richard I to hold a market, and still holds a market twice a week. Everyone who visits Kendal loves the narrow ‘Yards’ which lead off from Stricklandgate and Highgate. I learnt from the leaflet that they were constructed in the 18thc century ‘from the gardens of former town houses when people flocked to the town for jobs’. Look out for the green information plaques that give more history of the town. Kendal’s most famous artist, George Romney, was apprenticed at a studio in Redmayne’s (Redman’s) Yard. There’s a very fine memorial to Romney at the entrance to Kendal Town Hall. The Trail leaflet refers to Sandes Hospital Yard built in 1659, as a school. Through the archway I saw the neat gardens of eight Almshouses, still occupied. There’s an attractive little tea room there now. Returning along the river, as the sun set over the town, I realised I’d walked through almost a thousand years of history in just a few hours. If you’d like to do a little time travelling in Kendal, download the Kendal Trails Leaflet or Culture leaflet to create your own adventure.